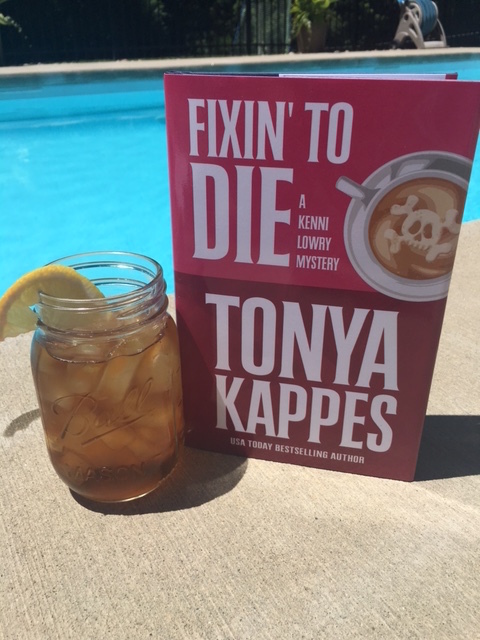 Tonya Kappes is making Mississippi Sweet Tea to match her new book, Fixin' to Die. You might know Tonya from her Ghostly Southern mystery series. If you are coming to Cottonwood, Kentucky, you have to stop and have a sweet ice tea from Cowboy’s Catfish. Bartley Fry not only makes the best fried fish ‘n’ chips this side of the Mississippi, he brews the sweetest ice tea that will have you craving it and send you back 3/4 to get more! He might get mad as a wet hen when he finds out that I gave the recipe, so I’m figuring y’all are going to keep it a secret. Combine the water and sugar for a mixture and set aside. Bring three quarts of cold water to a boil. Remove it from the heat and emerge the entire four large cold ice tea bags. Let them steep for about five minutes. Then you add that water and sugar mixture. Stir real good. Fill you up a mason jar full of ice cubes and pour the tea right over it. Enjoy with a lemon garnish or sprig of mint. I like mine plain, but we all got different tastes. You especially want to make this homemade sweet tea while reading Fixin’ To Die. Y’all will be on the edge of your seat wondering who killed Owen Godbey and your mouth is going to go dry with anticipation. Plus it gives you a sweet, treat straight out of Cottonwood. Tonya joins us courtesy of Escape Virtual Book Tours. Here are the other stops on the tour. That is the way to make it! I have read and reviewed on Mystery Playground, 2 of her Ghostly Southern Mysteries - A Ghostly Demise and A Ghostly Murder. Very exciting that she is starting a new series! Nothing like a tall cold sweet tea on a sweltering Kentucky afternoon!